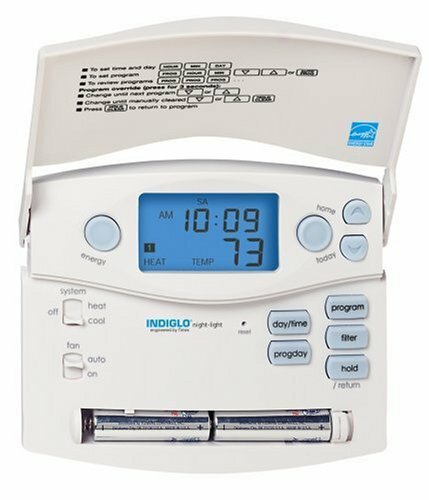 Up to 33% Year Round Savings on Energy Costs, Compatible with most furnaces & cooling systems (24 volt, millivolt & Single Stage Heat Pump, INDIGLO backlit display, Energy Star Compliant, Pre-programmed, Daylight Savings Key, Programmable Hold, Energy Monitor, Home Today, Up Opening Door for easy reference to instructions, Soft touch key pad, Temp. & Vacation Overrides, Filter Monitor, 2 Stage Low Battery warning, Battery Powered- 2 AA. Front access. Create the ideal indoor climate for a particular household's daily needs while conserving energy with this Energy Star-compliant programmable thermostat from Hunter. Users program for each day of the week, enabling the thermostat to automatically heat up at dawn on a cold morning or to run the air conditioner for longer hours over a summer weekend. By adjusting the thermostat to operate primarily when household members are home, the device reduces wasted energy and minimizes the size of the electric bill in addition to maximizing comfort. I like this model with the backlit display and the 'at home' feature. I have owned four different Hunter models and this one is the best. I installed it in minutes, but living way up in the snowbound north, we have a very simple heat-only system, so there were only two wires to hook up. The manual is straight forward, but if you are technically challenged you may want to have a friend install it or have a plumber do the job for you. This one is far cheaper with the same functions as the more mainstream heating companies. This thermostat is worth every penny! It does exactly what it should do, and the instructions were perfect for my heating/cooling system. I didn't have any problems putting it in. What the other review didn't mention is that this thermostat has extra features over the other Hunter models. The big difference is the Energy usage information. It tracks the amount of time that the system was on today, yesterday, this week, last week, and total since you installed it. It's neat being able to come home and see that the air conditioning was on for only 30 minutes, or on for 2 hours. This helps you figure out how your thermostat settings are affecting your real energy usage. It also has a filter reset reminder, which tracks the number of hours that the system has been used with the current filter. This is useful, since most filters say they last 3 months. But the real lifetime of the filter is based on how much air has been blown through it. You could run it for 12 hours a day, and it might only last one month. On the other hand, you could run it only 10 minutes a day, and it would probably last 6 months. With the filter reminder, it's able to tell you when you truly need to replace the filter. Also, the backlight works perfectly in my opinion. It only stays on for 5 seconds after you stop pushing any buttons. So if you are programming things, then it continually stays on until you are done programming. Plus, if you are just checking the current temperature or setting, 5 seconds is more than enough time to read a 2-digit number. I love this thermostat, and recommended it to a friend who loves it as well. It's much lower-priced compared to other competitors like Honeywell, and has a nice, simple interface. The blue backlight is gorgeous as well, and other brands don't all offer an indiglo backlight like this one does. There really isn't anything I don't like about this product. I HIGHLY recommend it! The thermostat will not work with a 2 stage heat pump with emergency heat. I love this thermostat, i am waiting to see the saving on my heating bill soon. I was able to program the thermostat to heat the house before my family awake in the morning and before we return home in the evening. Otherwise the temperature is decreased dramatically. Works Great, asy to install, saves you money. I received my order and hooked it up last night in less than an hour (mostly because I had a buzz and hooked all the wires up the first time backwards, my fault completely) and I can say without a doubt anyone should be able to hook this thing up. The only way I could see it being difficult is if you unhook the old thermostat without looking at the hookups first and even then my wires were the same color as the posts they matched so that should not create problems. I am pleased with both the thermostat and the fact I paid $50 less than I was going to for another brand. As for the clicking noise another review mentioned, I don't recall ever haveing a thermostat that didn't make some sort of noise when it switches on and I guess if you were standing next to it and no one was talking or making much noise it would grab everyones attention but come on I have had TV's make more noise when you turn them on. Great value. Excellent Product does the Job! Best Thermostat Value on the Market! The thermostat works great. The only beef I have with it is that the batteries fall out relatively easily. There isn't a guard that keeps them in, only a couple of 'teeth' on one and the pressure of the spring holding the other. It's a pain when you spend 10 minutes programing it, the batteries pop out and then you have to reprogram the entire thing over again. I concurr with the previous post. Not only is the wiring label incorrect, but the scheme is also confusing to the self-installer. I ended up returning this thermostat and purchasing a Honeywell model #183788, which had extremely straightforward wiring with easy to understand instructions. This is a nice thermostat. It does have a few issues I discovered now that it has been in use about a week. 1) The wiring instructions are not correct, at least not for my AC unit. I wound up calling an AC company who was nice enough to walk me through the wiring over the phone for free (there are a few good people left out there). Only two of the five wires actually went to where the instructions said they should. 2) The backlighting only stays on for about five seconds, its kind of a let down considering I paid $25 more for the version that is backlit over the same one without the backlighting option. Now that it is installed, it is easy to program and works fine. I gave this item two stars due to the 40% extra I paid for a disapointing backlighting feature and the incorrect instalation instructions. I almost had to pay a $100 service call to have someone install a $60 thermostat! I've owned many programmables over the years and I have to say this is the most unintuitive model I've ever had. I bought it because of the hours usage feature, which most other brands lack. However, that feature is not enough to make up for the difficulty of use. The principal issue is entering a "hold" mode. For starters, you have to go inside the cover to access "hold". Then it's easy to exit the mode as you're trying to adjust the temp. Also, the "set" temperature is not displayed on the default display. You have to briefly hit the up or down button button to make it flash up on the display. But of course, if you press and hold it too long, you start to change the actual set temperature. And this is just a partial list of nuances that I expect will bug the average user. If you're on top of it and tech savvy, you can navigate these issues. But when my parents visit and I need to deviate from the standard program, for instance, it's hopeless to instruct them on these nuances, so I have to take on all programming responsibility. But to be fair, it's not particularly difficult to initially program and install. It's just the other day-to-day interaction that is lacking. I highly recommend the Honeywell Electronic Focus Programmable Thermostat #YRTH6300B1007 (a 5/2, but I'm sure a 7-day model exists). It is much more user friendly than the Hunter.